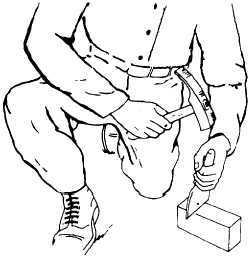 Figure 8-45.-Cutting brick with a chisel. 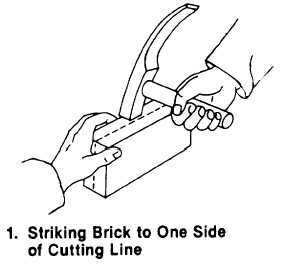 To cut a brick to an exact line, you should use a chisel (figure 8-45), or brick set. The straight side of the tool's cutting edge should face both the part of the brick to be saved and the bricklayer. One mason's hammer blow should break the brick. For extremely hard brick, first roughly cut it using the brick hammer head, but leave enough brick to cut accurately with the brick set. Use a brick hammer for normal cutting work, such as making the closure bricks and bats around wall openings or completing corners. Hold the brick firmly while cutting it. First, cut a line all the way around the brick using light hammer head blows. Then, a sharp blow to one side of the cutting line should split the brick at the cutting line (figure 8-46, view 1). 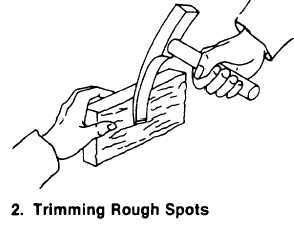 Trim rough spots using the hammer blade, as shown in view 2. The exterior surfaces of mortar joints are finished to make brick masonry waterproof and give it a better appearance. If joints are simply cut to the face of the brick and not finished, shallow cracks will develop immediately between the brick and the mortar. Always finish a mortar joint before the mortar hardens too much. Figure 8-47 shows several types of joint finishes, the more important of which are concave, flush, and weather. Of all joints, the concave is the most weather tight. After removing the excess mortar with a trowel, make this joint using a jointer that is slightly larger than the joint. Use force against the tool to press the mortar tight against the brick on both sides of the mortar joint. The flush joint is made by holding the trowel almost parallel to the face of the wall while drawing its point along the joint. A weather joint sheds water from a wall surface more easily. To make it, simply push downward on the mortar with the top edge of the trowel. Figure 8-46.-Cutting brick with a hammer.